The classic action RPG from Square Enix is available in New Zealand's App Store right now and will be coming to the rest of the world soon. First announced back at E3 and then promptly forgotten, the iOS remake of Secret of Mana looks like it will actually make its goal of releasing in 2010. For the uninitiated, Secret of Mana, dubbed Holy Sword Legend 2 in Japan, first came out in 1993 for the Super Nintendo Entertainment System. Eschewing the Final Fantasy-like turn-based combat of many Japanese RPGs, Secret of Mana emulated the top down action combat of Legend of Zelda: A Link to the Past, but the trick was that you could switch control between three characters while the others traipse around with you. The official release date for the iOS release is December 21st, and New Zealand is the first country to report that the game can, in fact, be downloaded to your favorite iDevice. Damn you, kiwis, for already being in tomorrow! 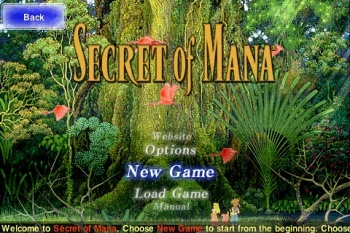 Once the sun reaches the correct time zone, you can purchase Secret of Mana for $8.99 on the App Store. Judging by the screenshots, the control scheme seems similar to other iOS games with "control sticks" appearing over the game display. Mana saw a release on Nintendo's Virtual Console for the Wii in 2008, but it's interesting that Square chose it to port for use with iPhones and iPads. Perhaps the success of porting Final Fantasy and its sequels to the device prompted Square Enix to invest in porting other classic games. An iOS version of Final Fantasy Tactics has been announced but is still awaiting a release date. That's the game that make actually make me cave and at least consider purchasing an iProduct. What other classic games should Square Enix considering porting? Chrono Trigger? The original Kingdom Hearts? Dragon Warrior/Quest?